On Feb. 10, NewsWorks published a letter from “area academics” making misleading claims about Mastery schools. As a Mastery principal, community activist, and a practicing child advocate for over 23 years, I would like to set the record straight. On Feb. 10, NewsWorks published a letter from “area academics” (“SRC plan to privatize 3 Philly schools a gross overreach, inconsistent“). It is disappointing that these “area academics” selectively used data to make misleading claims about Mastery schools while falsely positioning themselves as advocates for communities that they don’t live in — supposed champions of children they don’t see, interact with, or fight for. As a Mastery principal, community activist, and a practicing child advocate for over 23 years, I would like to set the record straight. All Mastery Renaissance elementary schools are significantly higher performing than Wister Elementary School. All six Mastery Renaissance elementary schools (previously the very lowest-performing schools in the city) scored higher on the 2015 PSSAs in reading and math by an average of 15 and 6 points, respectively. It appears that the “area academics” used only the District’s 2015 SPR ratings to draw their conclusions. However, a closer look at this year’s SPR undermines their conclusions. In 2015, the PSSA was completely redesigned to align with the new, more rigorous “PA Core.” As a result, scores across the state plummeted. Because the test is so different from the previous PSSA, the PA Department of Education decided that the 2015 test “established a new baseline,” and that it was not appropriate to make comparisons to the previous test. Consequently, the state is not rating elementary schools this year. The Philadelphia School District decided otherwise. As a result, SPR scores this year vary greatly from previous years and some unusual results were produced. Wister Elementary for example, was deemed a “model” for math growth, despite the fact that 3 percent of students were proficient and 76 percent scored below basic. In fact, if we set aside the District’s growth calculation, all Mastery elementary schools significantly outscored Wister on both achievement and school climate. Mastery Renaissance Schools have a long track record of turning around struggling neighborhood schools. I am the proud principal of Shoemaker middle and high school, which became a Mastery school in 2006. Before the Mastery turnaround, Shoemaker was the second-most violent middle school in Pennsylvania. From pre-turnaround to 2014, our PSSA scores increased from 23 percent to 69 percent proficient/advanced in math and from 30 percent to 64 percent proficient/advanced in reading. Last year, 80 percent of our seniors went on to college, securing over $5 million in scholarships. The authors quoted data from financial reports — 990 forms, which are required of all 501(c)(3) nonprofits — to suggest that Mastery schools’ achievement is due to funds we receive in grants. As academics, they should know better. The 990s they quote include federal IDEA, Title I, and Title II subsidies, which all public schools serving low-income students receive. We do receive some grants — highly competitive federal grants that are awarded based on our strong academic track record — and we are proud to be recognized for our work. The writers also claim that Mastery schools’ “rigid climate” could result in students eventually being expelled for “rolling one’s eyes or sucking one’s teeth.” That is simply nonsense. The writers have clearly not visited a Mastery school. If they had, they would know that our schools use a restorative practices disciplinary model. Staff members are trained in trauma-informed care. We regularly dedicate time for our staff to meet in small “professional learning communities” to reflect on the larger social context of our work and to examine our bias and assumptions. 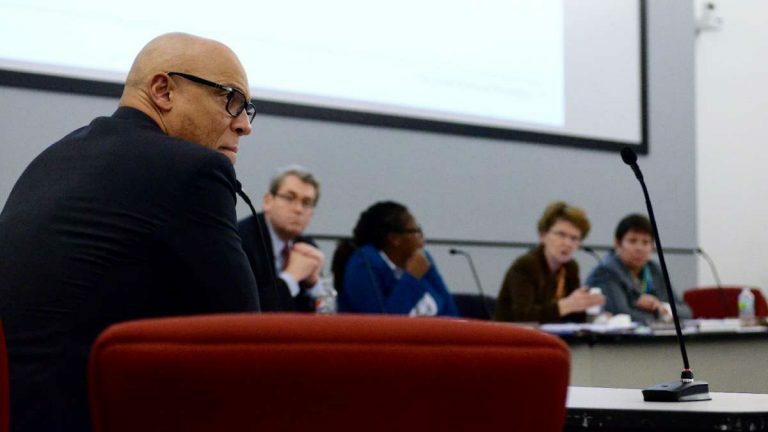 The fact is that, across all Mastery Renaissance Schools, the percentage of students who withdraw from the school for any reason has dropped by 30 to 70 percent compared to pre-turnaround. The “area academics” have it exactly wrong. We own what we need to improve on: suspension rates, accelerating academic achievement on the new PSSA, etc. However, critics should engage us and our communities and dialogue in good faith, and not detract from the authentic work being done by casting aspersions on the decisions of families to partner with Mastery schools. I must confess that I was angry to read a letter from a group of academics who decided to descend from their ivory towers to propose how students of color should be educated in our communities. That is the epitome of privilege and arrogance. I trust our decade-long track record of results and the feedback we receive from our students and their families. I trust the judgment of experts in instruction and school climate who actually visit our schools and provide valuable, informed feedback. I trust the judgment of parents who live in the communities we serve. Parents are voting with their feet — our Renaissance schools have increased enrollment by over 1,100 students (with over 500 on wait lists). That’s 1,100 neighborhood families that are again choosing their neighborhood schools — with Mastery as their partner. Since 2007, Sharif El-Mekki has served as the principal at Mastery Shoemaker Campus. He has also served as a principal for the School District of Philadelphia. He was appointed a U.S. Department of Education Principal Ambassador Fellow in 2013 and is the currently one of the founders of The Fellowship/Black Male Educators Convening.